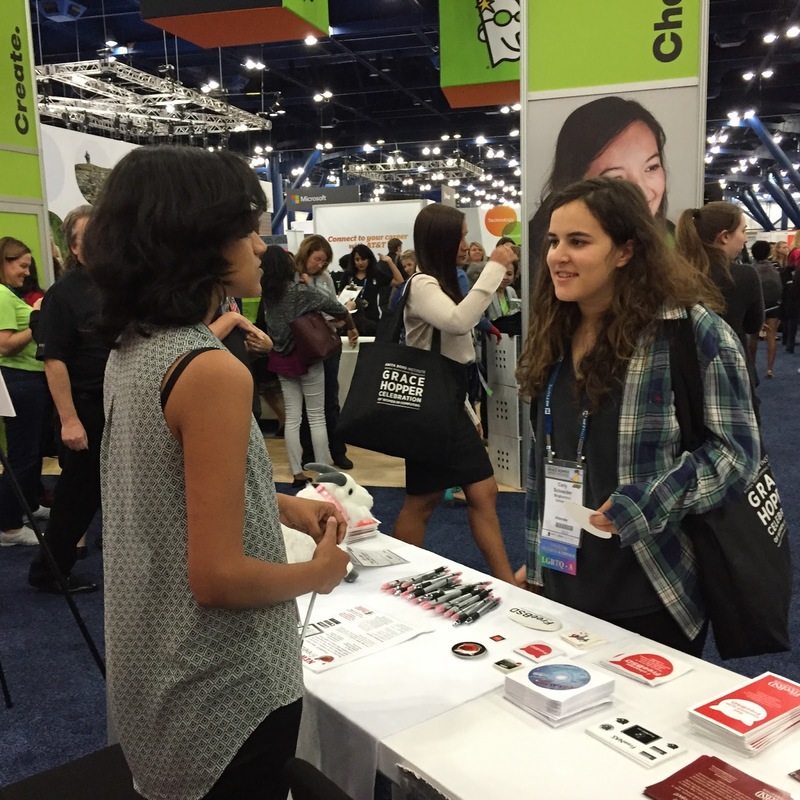 The 2015 Grace Hopper Conference was held in Houston, TX, October 14-16. 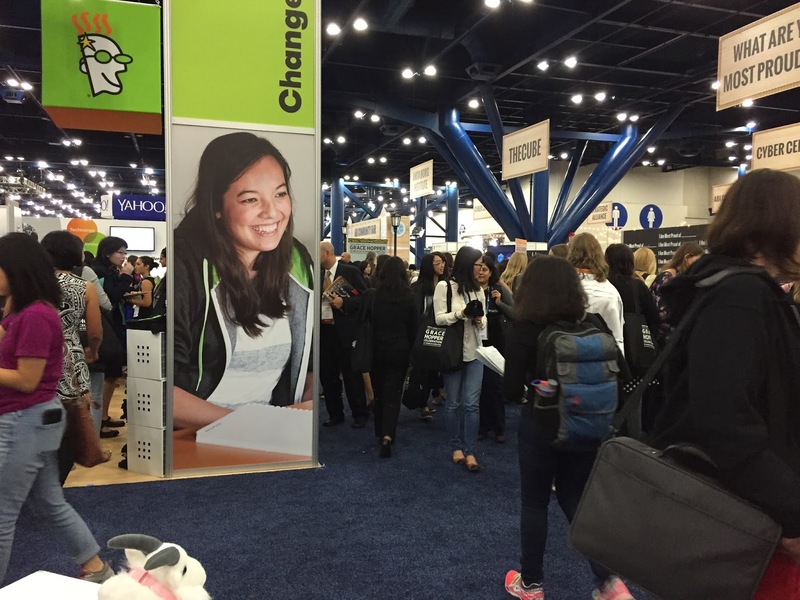 The conference is for women in computing and most of the attendees were female computer science majors, female software developers, and college professors. A few men that attended as well, but of the 12,000 attendees, the majority were women. I think everyone attending the conference arrived at the same time. The transportation services sure weren’t prepared for so many people needing rides into the city. 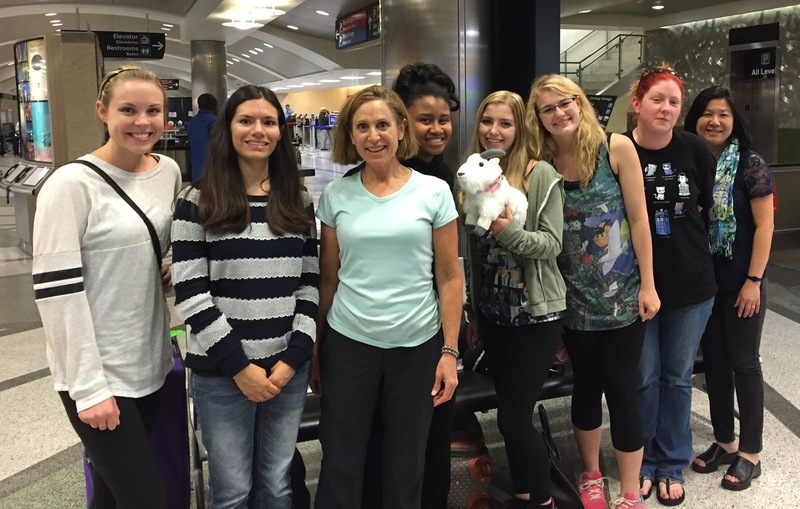 It was a long wait for the shuttle, but it gave me a chance to meet other women in computing. 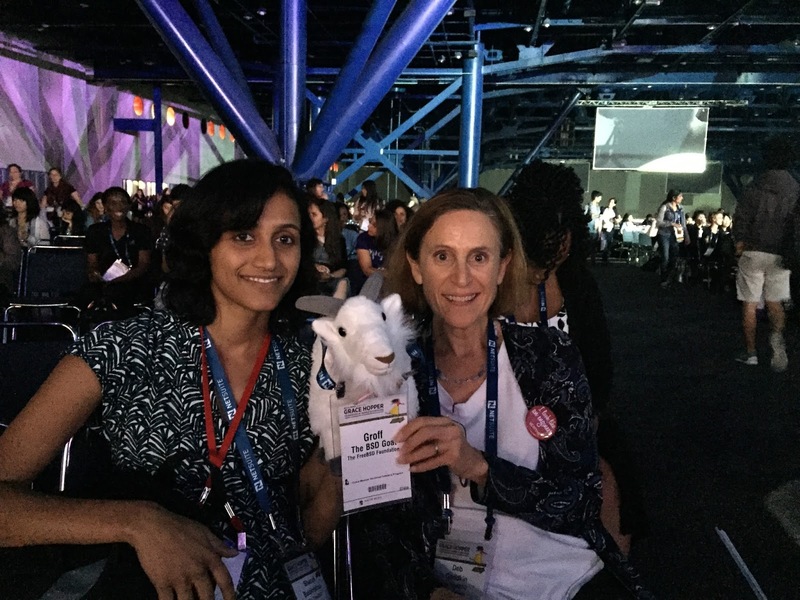 Groff the BSD Goat was there as well and became very popular. I continued networking once I got on the shuttle. I started talking to the only man on the shuttle, who happened to be sitting next to me. We realized that we knew each other over email, but had never met in person. He was the Director of Engineering at Juniper. Juniper is a FreeBSD user and a Foundation donor. I had his undivided attention for more than an hour! It was a great opportunity to talk about what our companies are doing, and he told me he wanted to hire two FreeBSD committers. The Foundation was a Silver Sponsor of the conference. 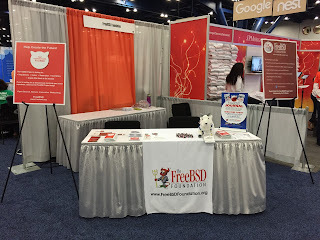 As we mentioned in our earlier blog post, we provided a travel grant for Shonali Balakrishna to help represent and promote FreeBSD at our table. Shonali was a Google Summer of Code student two summers ago and attended BSDCan this past summer. She’s currently a master’s student at University of California, Irvine. We had a great location for our table. Dru Lavigne, who attended the conference last year, gave me the heads up that we needed a sign to make us stand out amongst all the large corporations with their big booths. Anne Dickison, our marketing director, came up with two sign designs: one focused on getting people involved in the Project, and the other highlighted what the Foundation does. Wouldn't you want to stop by this table? Above is a picture of our booth. We were on a corner, next to a big aisle, so we had a lot of exposure. We were across from a large Go Daddy booth, which was next to a humongous Cisco booth. It took some thought to come up with a welcoming layout to make sure we didn’t get overshadowed. The Career and Community Fair opened Wednesday at 5:30pm and was open until 10pm. We were bombarded with students, professionals, and professors from the time the doors opened, and we stayed busy the whole night with people constantly stopping by the table. In fact, we spoke with more people than I ever expected. Our bright red sign seemed to help draw people in who didn’t know FreeBSD. They’d see our table, then read the sign and ask us about FreeBSD. Most were students looking for internships and jobs. People were also curious about our grant program. 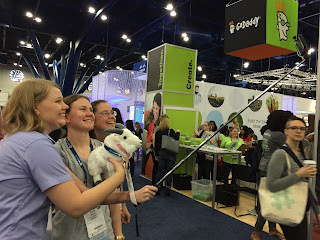 It may have helped that we had Groff (with his pink collar and own Grace Hopper badge) drawing people to our table. I also had my BeagleBone Black sitting on the table, and various people stopped by to ask about that too. I wasn’t surprised that people loved Groff, but I was pleased with how many people came by to ask about the BBB. That led to talking about BBB and RPI, and the opportunities with using FreeBSD on those platforms. I also want to thank iXsystems for sending us copies of PC-BSD to hand out. View from our booth. It was always crowded. On Thursday, Shonali and I attended the Keynote that was given by YouTube CEO, Susan Wojcicki, then we worked at our booth from 10am-5:30pm, finishing with the Plenary by Sheryl Sandberg. Both talks were interesting and inspiring. Afterwards, Shonali and I attended the NCWiT member party, where we sat down to review the "getting started" page on freebsd.org. Based on earlier conversations with attendees at events like womENcourage and OSCON, it seemed that people might be confused and intimidated by trying to find out how to get involved with the Project. 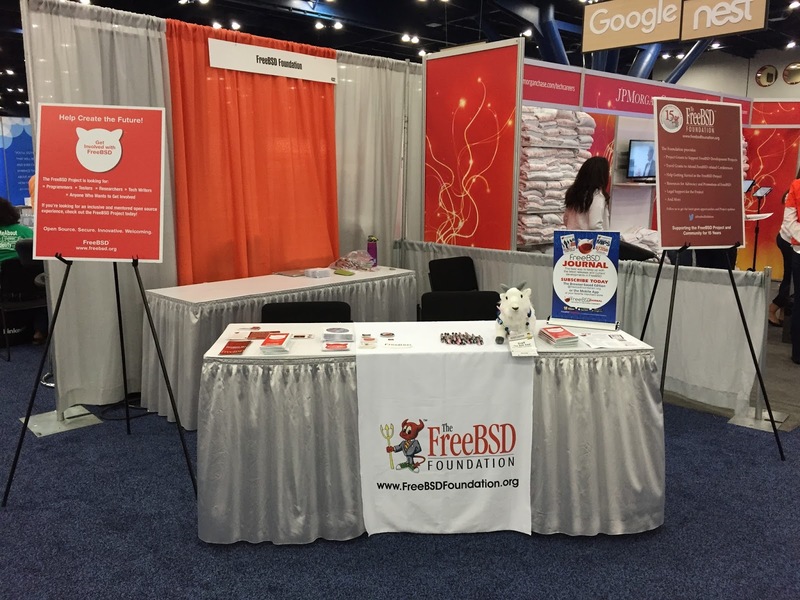 We came up with some ideas on how we can make getting started with FreeBSD an easier process. We will work with the Project and community to implement some of these ideas. On the last day of the conference, we worked at our table from 10am-2:30pm. We still had people stopping by our table after we were closed, and we made sure we talked to everyone. At that point we had three fliers and a couple of CDs left. We didn’t have a lot to bring home, except for all the cool t-shirts we collected. We then attended the last Plenary session with Groff, and listened to Janet George, Isis Anchalee, and Miral Kotb discuss diversity in tech. I was impressed with all speakers, especially Isis who was behind the hashtag #ILookLikeAnEngineer. But, who most impressed me was Miral Kotb. She simultaneously got a Computer Science degree from Columbia University and a Dance degree from Barnard College. Then, after working as a software engineer, combined her love for computer science and dance and created the dance company iLuminate. We were treated to a performance by the dance company, with all their high-tech costumes. While at the conference I talked to many students about getting involved in the Project. Some already knew about FreeBSD, some just wanted to get involved in an open source project, and some were looking for internships. We talked to all about the benefits of working on FreeBSD and told the students looking for internships that working on FreeBSD can be similar to working on an unpaid internship. I also talked to many professors about including FreeBSD in their curriculum. We had a lot of interest in this and I told them about the teachbsd.com website, which should be updated soon. I was excited when a woman came up to our booth wearing a badge that read Computer Science Department, University of Colorado, Boulder. The Foundation headquarters is in Boulder, and I’ve wanted to make connections with that department for a while. This is our local university and I’ve been eyeing them as a test site for our FreeBSD Bootcamp. After talking to her, I found out they have more opportunities for us than I expected. I’m excited to start working with them, and creating FreeBSD classes that we’ll be able to video and document for others to use. I made some great connections with people from the White House, research labs, students from around the world, people working in industry, and professionals from Microsoft, Google, Apple, and Amazon (just to name a few). I’ve already received emails from some students who want to get involved in FreeBSD. We had our share of students stopping by to give us their resumes. Many companies were there recruiting and interviewing, so it took me awhile to realize when a young woman walked up to our table giving us her name and shaking our hands, she was looking for a job or internship. We always told them about the opportunities that the Project offered and included information about the GSoC program. Next year the conference will be held at the same venue. How many places can handle 12,000 attendees? Even though it made for long lines for everything from the bathrooms, to Starbucks, to getting into talks and presentations, it was fantastic to see that many women in computing together at one venue. I connected with people in the Starbucks line, on the shuttle, and walking around on the expo floor, which was so big that was easy to get lost in. I was amazed at how many people stopped by our table, given that we were competing with huge companies, in giant, decked out booths. But, people saw our signs, Groff, and the friendly people staffing the table and came over. I believe this was a good investment for the Foundation to raise awareness of the Project, help recruit more women, and get more professors to include FreeBSD in their curriculum. We had a lot of interest from attendees wanting to find out how they can get involved. We also had a lot of professors saying they want to add something new to their curriculum and hands-on projects for their students. There are a lot of opportunities for FreeBSD to grow and expand. We'll be working with the community to help get some of these in place. Of course, we can't do it without you. We need your help to continue funding these efforts. Please consider make a donation today, to help us further our work in recruiting and creating FreeBSD educational material for events like these and beyond.